This blog posting is respectfully dedicated to one of those unsung heroes of BlogDom, Mr Malcolm Norton. Over the months and years that this blog has grown from being just a chubby cheeked infant to pock marked adolescence, Malcolm has been contributing scans and suggestions for future postings. It has been because of Malcolm's unstinting work that I have been able to reprise you chaps with early Eric Parker artworks from the Union Jack boy's paper published during those fabulous far away days of flapperdom. It was Malcolm that forwarded scans of penny dreadfuls, his passion for the golden age of British Boy's papers and comics seems boundless. This might be partly because by some weird quirk of fate he is stuck in a zone of endless sun, where even mad dogs retreat to the shade. Out of the many artists whose work Malcolm enthuses over there is one in particular whose brilliance seems to outshine all other contenders for his unquenchable devotion. 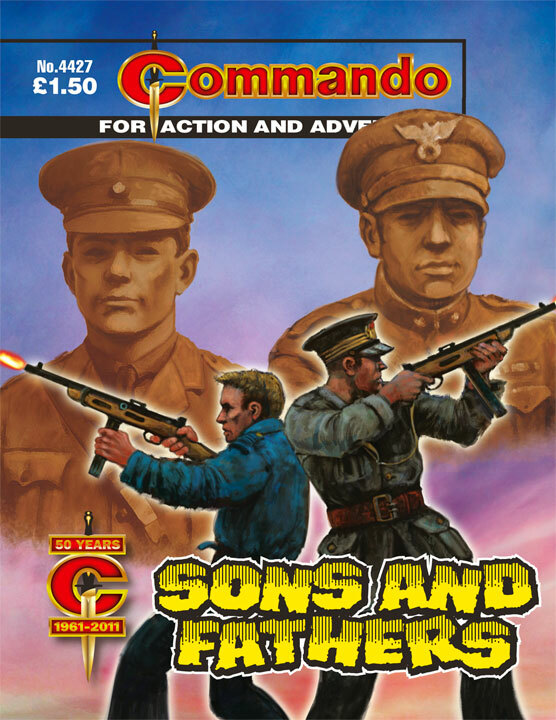 and once you have all shared with Malcolm the joy of seeing one of UK comicdom's most talented yet self effacing artists on video you can also check out the latest offerings from the battle scarred offices of the UK's sole remaining publisher of pocket war comics. 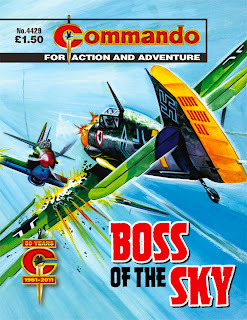 Commando's 50th Birthday Bash is certainly the most memorable and best sustained piece of promotion that has been accorded this comic in it's long and distinguished history. There they stood, back-to-back, Beretta sub-machine guns stuttering as they fought for their lives. 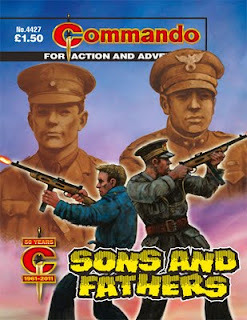 It had been the same many years before as their fathers had battled shoulder-to-shoulder in a heroic but doomed last stand. Would history repeat itself? Or was there another twist to the tale? After a run-in with his boss’s snooty, arrogant son, young Joe Gallagher quit his factory job. He wasn’t bothered, though, he’d wanted to join the Royal Engineers anyway. Flight-Lieutenant Alvar Brenner was a real mystery to his fellow fighter pilots in the RAF squadron he flew with. He came from Balkovinia, a country very few of them had even heard of. And when he first went into action with them, he seemed to know every move the German pilots would make — as well as just how their aircraft would perform. 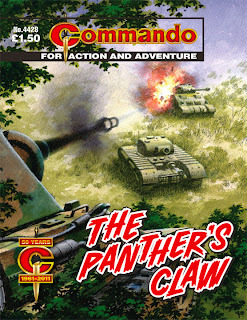 A couple of years ago, I found a box of my own Commandos lurking at the back of the garage. Goodness knows how many times I’ve moved them from house to house. When I went through them though, I knew there was one missing. Like many a Commando reader before me I just could not remember its name so it was a great surprise to stumble into it while looking for something else. Re-reading it was not a disappointment. The Wilkinson/Mira combination provided an intriguing plot and crisp, accurate line art. Ken Barr has seldom done a better cover for my money. Hidden treasure indeed. 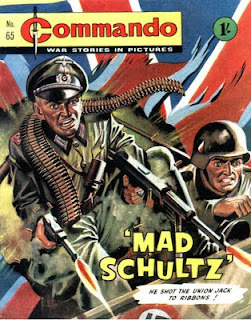 ‘Mad Schultz’ – He Shot The Union jack To Ribbons! Out of nowhere they appeared, miles behind the front line, falling on undefended convoys like wolves on a flock of sheep. Machine-guns blazed, trucks were blasted to pieces, and men fell in roadside ditches. Then they were gone as swiftly as they come, and yet another British supply column was left a smoking ruin. They were German guerrilla fighters, trained killers every one, and they were led by a man as fearless and cunning as any. 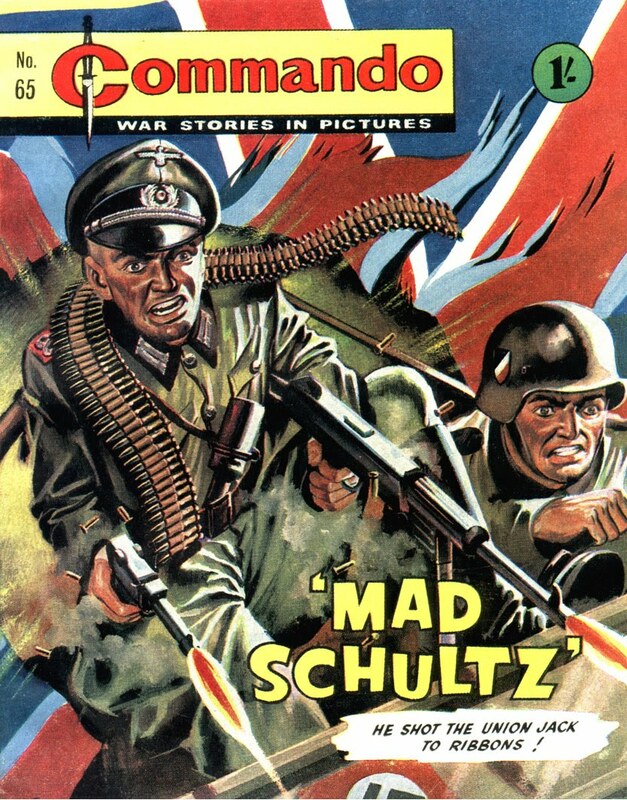 Captain Schultz was his name — special Nazi commando. 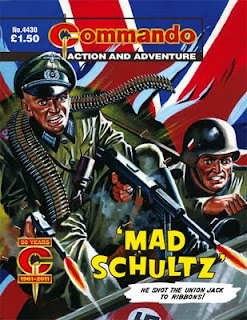 Soon the question was on every British soldier’s lips…where will Mad Schultz strike next? While we were scouring the Commando archives for the material we needed to put together “Commando: 50 Years a Home For Heroes” the cover of this book was brought out for scanning. Now, you have to admit that, whatever else it might be, it’s an eye-catching illustration. So, with the doors to the vaults standing open, I had to reach in for the copy and take it away for a read. I had to, you understand, it would have been dereliction of duty otherwise. 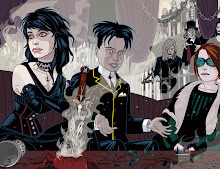 The hard-hitting Redbridge story lives up to the promise of Ken Barr’s cover and Lopez’s inside artwork has a dark quality which really suits the story even if his touch is a little cartoon-like in places. The icing on the cake is that line under the title though, “He Shot The Union Jack To Pieces.” Priceless! Hooray for Mr. Malcolm Norton! Great covers, Pete! Many thanks Dave. Two Ken Barrs in a fortnight can't be bad!